I seem to recall growing up in England that a pineapple was regarded as a valuable item... wow, tropical fruit! And things like mangos and papayas were just words. Even the humble banana was a special treat. Maybe my memories are hazy, but fruit in England meant apples and pears, plums and maybe peaches. Oranges were not uncommon, and there were always satsumas at Christmas time! There were raspberries in season, and we often went blackberry picking. The words "tropical fruit" brought to mind jungles, far away places, unreachable lands. This was 30 years ago. Holidays to a place like Thailand were all but unheard of. A few brave backpackers maybe, when backpacking was still an adventure! What is "Street food"? Well, I mean anything that is not a restaurant really - simple roadside stalls, sometimes with wheels or built onto the side of motorbikes. Temporary noodle joints that open in the evening outside shops that have closed for the day. Hawkers carrying baskets of snacks, grilled chicken by the roadside, motorbikes with kitchens as the sidecar. 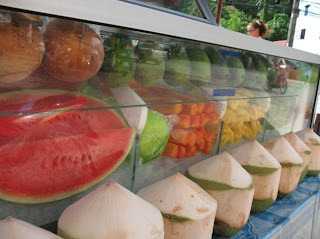 And fruit stalls are everywhere, even in the main beach areas of Phuket. Mostly they are mobile. Honda Wave mopeds retrofitted with ice filled glass displays full of fruity goodness. On the photos on this page you can see watermelon, mango, papaya, pineapple, guava, canteloupe, coconuts, pomelo, rose apple... missing are things like mangosteen, durian, rambutan - all of which are pretty common. Feeling fruity? 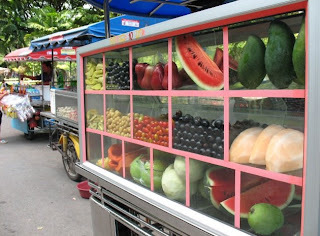 A portion of whichever fruit you want is normally about 10 Baht. Great at breakfast time, or any time. I am a fan of rose apples (called cham-poo in Thai). I don't think I ever saw them before coming here. I also like a bit of papaya now and then. If you never had mangosteen before.. try it. If you never had durian before, you can feel thankful! Ah, go on, try it... try it all!